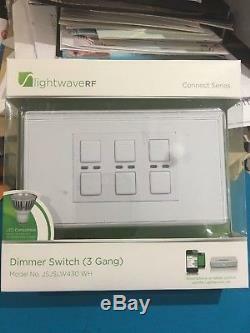 Standard fitting 3-Gang wall dimmer that can be wirelessly controlled using LightwaveRF Home Automation technology. Easy to install - fits into standard 2-gang back boxOne and two-way operationCompatible with all LightwaveRF productsChoice of four stylish finishesCan be controlled via PC and Smartphone, when used with the Link controllerThese stylish 3-Gang dimmer switches look and operate just like any other standard wall switch/dimmer as well as being controlled by any LightwaveRFHome Automation Remote Handset or Controller. The dimmers are suitable for one or two-way operation and are installed in the same way as any standard light fitting using just a screwdriver. No extra wiring or cables are required and the dimmers fit into a standard 35mm back box. Note: A LightwaveRF 2-Way (Slave) Dimmer is also required to be used for two-way operation. If you add a LightwaveRF Link controller to your network, you will be able to control these dimmers (and all devices) from anywhere in the world from your PC or Smartphone. Available in four finishes - Chrome, Black Chrome, Stainless Steel and White. Only opened to check contents. The item "LightwaveRF JSJSLW430WH 3 Gang 1 Way 210 W Master Light Dimmer Switch White" is in sale since Monday, March 12, 2018. This item is in the category "Home, Furniture & DIY\Security & Home Automation\Home Automation". The seller is "esoredivad" and is located in Staines. This item can be shipped to United Kingdom, Austria, Belgium, Bulgaria, Croatia, Cyprus, Czech republic, Denmark, Estonia, Finland, France, Germany, Greece, Hungary, Ireland, Italy, Latvia, Lithuania, Luxembourg, Malta, Netherlands, Poland, Portugal, Romania, Slovakia, Slovenia, Spain, Sweden, Australia, United States, Canada, Brazil, Japan, China, Israel, Hong Kong, Norway, Malaysia, Mexico, Singapore, South Korea, Switzerland, Thailand, Chile.